What Type of Boat Should I Get? This is the most common question. The answer is individualized, and requires answering some other questions. For instance, how many people will the buyer be boating with? The boat must have that capacity. Next, is there an activity that takes precedence for the buyer over others, such as fishing or wakesurfing? Most boats can serve multiple roles in a pinch, but a real enthusiast will want a boat designed to help them make the most of their primary activity. Next, ask yourself whether you will need to sleep aboard the boat? Not everyone wants a cabin, and with no living space, room on deck is maximized. Of course, some boaters like a respite from hot sun, cold or damp, and for them, shelter might be welcome, even if sleeping aboard never occurs. Ask yourself whether you will be trailering the boat? For one thing, the boat selected must not exceed the trailering capacity of your car or truck. Does the boat need to fit in a garage? How long is it on the trailer? How high? Selecting the right type of boat takes some soul searching and, preferably, some time spent aboard friends’ boats or rental boats to help narrow down the features wanted. Both have merit. If you buy a new boat, you will pay more. With a new boat, you should be able to rely on the dealer’s reputation (do get good referrals — picking the dealer is important) and the manufacturer’s warranty for peace of mind and service. You will generally be able to finance a new boat for a lower rate and, perhaps, with a lower down payment. A new boat provides the most modern systems. It’s hard to beat the "bragging rights" and pride in ownership of a brand new boat. Used boats can be had for less money than new boats. Many used boats might still come with a remnant warranty from the manufacturer and, if purchased from a dealership, might come with a 30-90 warranty (varies by locality). In any event, we recommend you hire a licensed marine surveyor to conduct a pre-purchase survey of any used boat you are considering. Add this cost — which might range from $500 to $1,500 — to the cost of the boat. Used boats do not have the latest upgrades, though many have been refitted with new systems and motors. Used boats generally suffer less from depreciation compared with new boats. Used-boat financing usually requires higher rates, bigger down payments and shorter terms. When comparing new and used boats, one is not better than the other, but each offers benefits that the other does not. It’s up to you to decide in which camp you are more comfortable. Where Should I Buy a Boat? If you are buying a used boat, you will buy it where you find it — whether that is at a dealer’s yard, on a listing at a boat show, or in the driveway of your neighbor. If you are buying a new boat, you will look in some specific places. The first place to check out is the local dealer’s showroom. Your local dealer can service your boat and motor and, honestly, is going to be at least as responsible for your happiness as a boater as they are for the actual boat itself. Look for “ demo days” and “owner rendezvous” events that you can attend to ride on some boats, meet with other boaters, and develop a rapport with your local dealer. Another great place to buy a boat is at a boat show. At the show, you can climb aboard the two or three boats that make up your “short list” and compare the features directly. You can also get quotes from the competing manufacturers for the boat sale, as well as other desired services such as storage, dockage or winterization. Boat shows are also a great place to shop for financing: Make the banks earn your business. Finally, many boat- and engine-makers offer incentives for making the purchase at the show (though many of these can be had at the dealership if one is firm in asking). How Much Do Boats Cost? 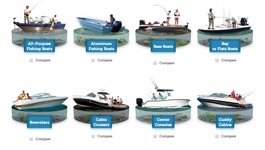 Boat costs range from under $10,000 for a new small fishing boat or PWC to millions of dollars. Perhaps more useful is that, according to the latest data from NMMA, the average price of a brand new powerboat hovers at about $40,000. For some, this seems high, but experienced boaters might ask that these folks consider the following before dismissing boating as expensive. Boating is commitment in time as well as money, like other recreational activities. Few of those provide the return that boating does. For example, a boat allows a family to go fishing, participate in watersports, cruise to interesting places, and see and do things together that the land-bound cannot. Boat owners always have a weekend getaway on tap. Boating is also an investment in the ties that bind. It’s harder to get a more “captive” audience with family and friends than taking them out on the boat. The bonds that come from learning new skills together, experiencing new things together, and just being in a different environment together are tough to beat. 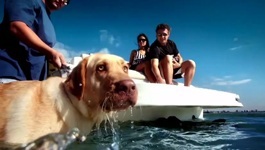 No bones about it: It costs money to go boating, as it costs money to do many other activities. The benefits, though, as millions of boaters will attest, are unique and just plain tough to beat. What Are the Additional Costs of Boating? In 41 U.S. States and Canada, yes you need a license, or at least some formal education. In many instances, you can be "grandfathered in" if you are of a certain age and can prove you completed a boater-safety course in the past. If not, you must take a boater-safety course. These are offered in a variety of settings, including online, by organizations such as the United States Coast Guard Auxiliary and the United States Power Squadrons. In many cases, completion of a boater-safety course can result in discounted boat insurance. How Do I Learn to Drive a Boat? Experience. New boaters need to start off slowly and expand their range of operation as they gain experience. Operating a boat is very little like operating a car. For example, there are no painted lines on the water, and buoys serve a different purpose than traffic signals. But, by attending a boater-safety course, boaters can gain understanding of navigation aids. Then there is the water. The height under bridges and overpasses changes constantly with the stage of the tide — sometimes you can fit under and other times you cannot. This type of knowledge is localized, and learned best by boaters who go out slowly at first, increasing their range of boating over time. The surface of the water is bumpy and can change from hour to hour; this too takes some time on the water to predict. But, with time, boaters come to understand how much wind, and from what direction, affects their waterway adversely. There are charts published and inexpensive marine electronics that show the depth of water one is operating in and any hazards, such as underwater rocks, stumps, shell banks and sandbars. It’s prudent for boaters to purchase and understand the use of charts and marine electronics. Current and wind can confound new boaters who are not prepared for them, especially while docking. But those boaters who proactively seek out knowledge of these forces and practice maneuvering can catch on quite readily. Operating a boat requires the gaining of experience — but that experience comes from going boating, so it’s all good! Truly motivated boaters jump-start their learning. There are good books on the subject of boat handling, and many expert magazine articles, such as the monthly Seamanship column in Boating magazine, that one can refer to. As you would expect, taking a boater-safety course is a great idea and will up your safety and enjoyment of all aspects of boating. Professional captains can also be hired, if one desires, and there are many schools that teach boat handling on the water. Needless to say, nothing beats the firsthand learning gained by taking the helm! Where Do I Store My Boat? Many boaters store their boat on their own property. If they own a trailer, the trailer serves as the storage bed. If there is no trailer, a hauling service can be hired to place a boat on blocks and stands on your property in fall, and then retrieve and relaunch the boat in spring. Some trailer boaters rent yard space from storage facilities, RV parks and service stations. In some locales, vacant lots can serve for a fee. Security and convenience of these options varies. If you cannot utilize your own property for storage, then you can seek out a marina or boatyard. Options here range from "wet storage," which means in a slip and ready to go at an instant to "rack stored," also called “ high and dry,” wherein the boat is stored in a building and moved to the water by forklift on request. For winter storage (or any long-term, nonuse storage), yards and marinas offer storage inside and outside at varying rates. What Type of Activities Can I Do Aboard My Boat? But there are loads of ways to enjoy your boat that might not be obvious to a beginner. For instance, boaters often pack some food and drink to spend an afternoon slowly touring the coastline of some lake, cove or bay, enjoying the scenery and checking out the houses, and spending time with family and friends. Other times, a boat is a great way to go out and view fireworks. Still other boaters enjoy going to big-city waterfronts, visiting sporting events by boat, going out to eat by boat, or enjoying concerts by boat. If you stick around boating, you’ll hear the term “rafting-up.” This refers to an activity in which a bunch of boaters gather and anchor or tie up beside one another, often at a scenic cove (aka “party cove”) or sandbar to simply socialize. Raft-ups include visiting other boats, swimming, kayaking, enjoying music and more. High-performance boaters enjoy racing. Of course, there are also “poker runs,” the watery equivalent of auto rallies. In a poker run, like-minded boaters gather and cruise to some location together — perhaps for lunch — and then return. The goal is camaraderie and adventure. Everybody is a winner at poker runs. As a platform for paddle sports, boats make a great conveyance for transporting a stand-up paddleboard or kayak to more-remote locales. Boats are, of course, great for those who’d like to dive or snorkel. If you’ve never seen the stars from miles out in the ocean, where sea and sky appear to be one, well, you just haven’t seen them! What you can do aboard a boat is limitless. All you need is imagination and a desire to be outdoors. Got a boat? Just add water! What Type of Vehicle Do I Need to Tow My Boat? The type of vehicle you need to tow your boat will vary by the size of the boat. A small skiff or PWC may be towed by a compact car. A big diesel pickup is required to haul around a 40-foot race boat. For most boaters, an SUV or pickup truck with a V-6 or V-8 engine serves well. Boating magazine, for one, offers a “Guide to Towing,” which many find useful. Of course you probably already know that a small vehicle can tow a small boat, and a big truck can tow a big boat. Many new boaters wonder about the advantages of towing. There are many. For one, you get to cruise your boat to many more locations, whether just across town or across the country. With a trailer, a boater can cover many miles quickly on the highway and then put in at new and exciting boating locations. Another benefit of trailering is that storage costs can be kept lower. With a trailer, boaters can bring their boats home and store them on their own property. Some trailers even boast folding tongues that allow them to more easily fit in a garage. Of course, keeping the boat on a trailer makes corrosion much less of a worry compared with storing a boat in the water. What Happens If My Boat Breaks Down? What you will do if your boat breaks down can vary. If you are on a small lake or bay near a populated area, you may simply paddle the boat into shallow water, anchor it, and then wade ashore and walk to assistance. On the other hand, you might be far from land — or far from a city center — and need to call for assistance and a tow back home. But who would you call? If you keep the boat at a marina, that might be your first call. Many marina’s provide towing — either as a courtesy or for a fee — if you will have them do the repair work. There are also nationally franchised towing services such as BoatUS and Sea Tow, both of which will come and get you, offer minor mechanical assistance (or fuel, if you ran out of gas) and towing. There are variable fees for these services, but generally, purchasing an annual plan with either service can prove most economical. Another option is to call a friend with a boat. They might be able to come and get you. In fact most boaters understand that you cannot walk home, and will offer to help. So flag down passing boats or hail boats using the VHF radio. Chances are a good Samaritan might tow you in. Finally, there are rescue beacons, such as EPIRBs and PLBs that can be purchased. These are to be used only in life-threatening emergencies, such as you broke down and the boat is sinking, or there is some medical urgency. (Do not use them because you are out of fuel or because you will be late for dinner.) Push the button, and the satellite-based signal will call in the authorities.